Taste test: These thin potato chips were very crisp and had a pretty good, but only moderately hot, jalapeno taste. 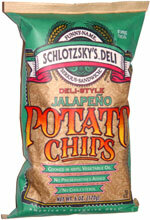 The level of flavor varied from chip to chip, and the ones at the bottom of the bag seemed to have the most flavor. There were tiny red and green spots on some of the chips. Smell test: Definitely a jalapeno smell, made my mouth water.